Covenant is how God has chosen to communicate to us, to redeem us, and to guarantee us eternal life in Jesus. These truths, revealed in the Bible, are the basis of Christianity. The Bible is a covenant document. The Old and New Testaments are really Old and New Covenants. The word “testament” is Latin for Covenant. 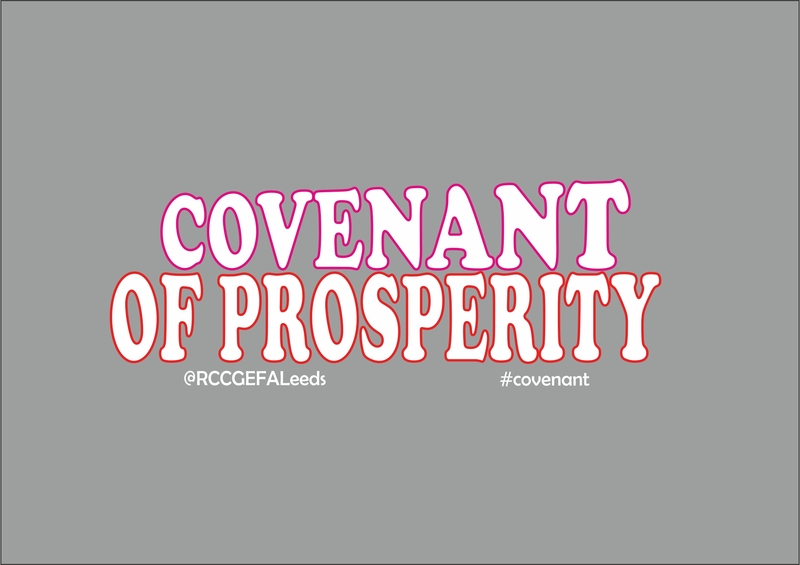 The Biblical Covenant am talking about today is the Covenant of Prosperity. I have discovered through personal encounter, study, research and understanding of biblical principles that the power to get wealth is a direct function of the covenant. When you enter into the covenant of prosperity everything automatically begins to walk in your Favour. Prosperity is not a function of binding and loosing, neither fasting nor praying. It is a Covenant you practice. What is a Covenant? Covenant is a binding agreement between two or more people which leaves each of them with a responsibility. Anytime a covenant is made, a binding agreement is enforced. Take for instance my wife became my wife the day we wedded, marriage covenant was enacted that day. Now my wife cannot be fasting and praying to be my wife because she is already my wife. Likewise when you enter into a covenant of riches you do not need to fast and pray for prosperity you just walk in the covenant. Your location has nothing to do with your prosperity, Isaac was in the land of Gerar where there was tough famine, everyone was living in hardship but in the same land Isaac had more than enough, He was extremely rich. Isaac was walking in the covenant of wealth so economy had no effect on him as the economy was getting tougher he was getting richer without fasting and praying or binding and loosing, he had something that others did not have. Covenant is superior to location or connection, when covenant of prosperity is enacted financial destiny is guaranteed. The reason many are struggling today is because they have not entered into the covenant of prosperity, when you locate the covenant and enter into it, you are automatically out of stress for life. Abraham walk in the covenant, he was exceedingly rich, he commanded riches in all spheres, he became a fig that cannot be despised. Genesis 13:2 – Abram was very rich in livestock, in silver, and in gold. Jacob walked also in the covenant during economic crunch, he had more than enough. During famine he had great access to money, he asked his children to go with double money that could afford them to buy food from a foreign country. Take double money in your hand, and take back in your hand the money that was returned in the mouth of your sacks; perhaps it was an oversight. Children of God, covenant is greater than anything, all you need is to be connected to the covenant of riches and your life will take a new turn. No famine or economic crunch can stop you when you are connected to the covenant. If famine could not Isaac or Jacob. No famine or economic crunch can stop you when you are connected to the covenant. You are not down because of the economy; you are down because you are not connected to the covenant. Your prosperity is not connected to your location but your connection, once you are connected to God. Then you can be sure that you are blessed financially for life. Listen to me very well your lifting in life is a direct function of your walking in the covenant not religious fasting or praying. Your altitude is not determined by your latitude but rather by your attitude. Your environment is inferior to the power of the covenant. Every increase outside the covenant is a decrease in disguise. Where you are is determined by who you are, who you are is far more important than where you are. When you walk in the covenant you cannot but be distinguished. There is no country where you don’t find the poor and the rich; also there is no country where you don’t find the borrower and the lender. Each chooses what they want to become. Your choice to walk in the covenant of riches will usher you into another dimension of life. God always respect covenant, all you need is to align yourself with the covenant. “Thus says the Lord: ‘If you can break My covenant with the day and My covenant with the night, so that there will not be day and night in their season, then My covenant may also be broken with David My servant, so that he shall not have a son to reign on his throne, and with the Levites, the priests, My ministers. If no one can stop the covenant of the day and night, so also no one can ever stop your riches when you are fully connected to the covenant of riches. Your prosperity is not connected to your family background , even if you are born into the poorest home once you are connected to the covenant of prosperity nothing can stop your breakthrough . The great question is this, How do you get power to get Wealth according to Deuteronomy 8 vs 18 that we read earlier. Thou shall remember The Lord thy God, The first sign post in the school of wealth is Remembering God. Until you remember to make God first in your finances, you can never be rated first financially. Where you place God is where He also places you. Until you are fully addicted to given, don’t expect His best. Making God first is the principal controller of prosperity. To rate God last in your finances is to be rated last on earth. To enter into covenant of prosperity is to willingly, ‘unreservedly and joyfully hand- over all you have unto God. When you do this from your heart of heart God will also hand- over His riches unto you. In a marriage covenant the man hand over his possession to the wife whiles also the wife hand over her body and possession to the husband. Likewise in the covenant of prosperity a man hand over all he has to God while God hands over His blessings and riches to the man. Example of giving that I have done. When it comes to giving to God I don’t calculate at all. All my beings enjoy giving. Listen to me the power to get wealth is not contacted by daily confession but rather by making God first in your finances. All the people that were rich in scripture never fasted or prayed for prosperity, they simply made God first. Abraham entered into the covenant through a Heart for God. Can you imagine Abraham could not withdraw his only son Isaac from God, when God asked him to go and sacrifice Isaac, he simply obeyed. Abraham was tested by God and he passed the test so God had no choice but to bless him. Until you pass the God test you can never be promoted by Him. God will, always place His riches in the hands of people who make Him first. Motive determines motion; God will check your motive before He promotes you. If your motive to get rich is to promote God’s Kingdom, you can never run dry of heaven’s blessing. Your heart for God determined your placement on the earth. Abraham never cried to God before God blessed him, he only had a heart for God. All you need this morning to enter into a covenant of prosperity is a Strong heart for God; develop an unshakable love for God. I mean the type of love that Abraham had for God, not love by mouth but practically. Don’t tell him you love Him when you cannot give Him what you have. The Story of the brother who went to camp to pray doing dry fast for financial prosperity. A man of God saw him and asked him he pays tithe and offering and he laughed and said it’s someone who has more than enough that give to God, I am just managing. The man of God told him to go and break his fasting because he is just on self-imposed suffering. He was then asked if he has seen a farmer who has not planted but sold out to prayer & fasting, praying and fasting to reap in the harvest season. Listen prayer outside Obedience is a waste of time. Listen to me prayer outside obedience is a waste of time. First of all, develop a hear t for God, Then your throne becomes guaranteed. Get to a point of total addiction to God’s kingdom, that is the basis of covenant wealth. To become a custodian of Kingdom wealth, you must be totally sold out to God. If what fills your heart is how to promote God’s kingdom, ‘then your breakthrough is certain. Another thing you must understand as you chart your course in the school of prosperity is that it is only God that gives you power to get wealth. Deuteronomy 8:18 – “And you shall remember the Lord your God, for it is He who gives you power to get wealth, that He may establish His covenant which He swore to your fathers, as it is this day. It is He that gives power to get wealth not your economy, not your uncle, not your bother, not your sister. Stop looking at man. God is enough. The reason many are living in disappointment today is because they made men their source. Listen to me God is more than enough, trust Him and hang on Him, He is the only one that can take you from where you to where you ought to be. Another thing to note in the school of prosperity is, that power to get wealth is through power to lay down. Famine had no effect on Isaac because he had power to get wealth. How can one has the power to get wealth? Through power to lay down. Until you are a giver you can never be a receiver. Until you know how to sow, you cannot know how to reap. Genesis 26:12 – Then Isaac sowed in that land, and reaped in the same year a hundredfold; and the Lord blessed him. No amount of prayer and fasting can bring a harvest when no seed is planted. Many people today want to reap when they have not sown. Many Charismatics have substituted the place of sowing for confession and prayer, no amount of confession can bring a harvest outside seed planting. Until you have the power to lay down, you can never have the power to receive from Him. Power to lay down precedes power to get. If you cannot give to him what you have He cannot give to you what He has. Every opportunity to give is opportunity to rise. Your rising level financially is a direct function of your giving level. Covenant blessing only comes through covenant act. Giving time is a testing time; it is a time that God uses to test a man if he is really ready for financial breakthrough. Until you are kingdom addicted don’t expect kingdom addition. Covenant blessing only come through covenant act. Until you give what you have don’t expect what he has. Can you imagine God sending Elijah to widow of Zarephath in the time of drought and practical famine, ‘the woman only had her last meal to eaten by her and her son and die. Why that woman, may be God was looking for an opportunity to bless her in the time of famine because this woman must been a great giver. It really takes a great giver to give her last meal. And Elijah said to her, “Do not fear; go and do as you have said, but make me a small cake from it first, and bring it to me; and afterward make some for yourself and your son. For thus says the Lord God of Israel: ‘The bin of flour shall not be used up, nor shall the jar of oil run dry, until the day the Lord sends rain on the earth. Why many are wallowing in poverty today is because of stinginess, they keep everything to themselves only! They don’t know that increase does not come by acquiring but by releasing. Proverbs 11:24-25 – There is one who scatters, yet increases more; And there is one who withholds more than is right, But it leads to poverty. The generous soul will be made rich, And he who waters will also be watered himself. Power to lay down is what procures power to get. Stop just acquiring; start releasing that is the way to a lasting prosperity. Power to lay down is what procures power to get. Until you are giver you cannot be a receiver.